The ‘NICCY Youth Panel’ (NYP) was established to help the Commissioner in her day-to-day work. The Youth Panel is made up of young people who share their experiences and thoughts with the Commissioner and her staff and actively help NICCY make decisions about issues that affect children and young people. The panel's aim is to empower and help children and young people to take an active and full part in participation and discussions on, issues affecting children and young people in Northern Ireland. Examples of their work in supporting the Commissioner are mentioned throughout this strategy alongside our youth panel engagement guidelines; how the different teams within NICCY engage with the NYP, and the importance of the youth panel in our Participation Screening process. Where the appropriate experience is not found within current NYP membership, we will engage with children and young people and relevant organisations that have the appropriate knowledge and experience. NICCY and the Participation staff regularly review how we engage with children and young people to ensure that we make the best use of our resources to maximise our outcomes. Participation Officers have spent time developing and refining resources which linked children and young people's rights and the UNCRC to both the revised school curriculum and youth work curriculum. Cascading or multiplying effect; e.g. NICCY’s Train the Trainers programme. The ‘Training the Trainer’ model has been developed over the last five years for student teachers. 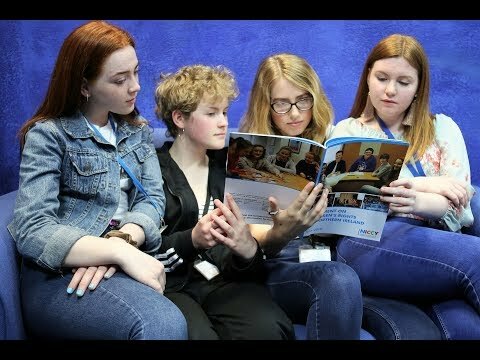 This model of children’s rights training was initially explored in St Mary’s University College and has been expanded to include other colleges/ youth workers / peer trainers who will in turn either deliver training to young people or develop their practice when working with children and young people. For more information please see our Training section.